having visted sunny beach last year I knew what to expect and looked at the coments made about this the Tara beach on this site and in fairness some of them where correct but either the hotel has gone down hill or I pick a bad week my main concern was that hardly any member of staff on repection could speak english and if you had something to say you had to come back later that day or the next day. The food was better than where I stayed last year (Flora Park )but the service did not match up to the Tara Beach rating and being a Iberostar should have been much better the restaurant was gaurded like fort knox no room card the would not let you in however on more than one occasion tramps sneeked through the garden patio enterance and helped themselfs we knew the where tramps as later saw them begging on the prom having just had a free meal .i would advise anybody going to this hotel to take your own tea bags as every day they ran out along with corn flakes ,butter, fresh cold milk,coffee, and the outside pancakes only was there for one day in the whole week. This hotel was 1st class!! We had read many reviews about the hotel and Sunny Beach itself and were quite worried before we arrived in Sunny B. We had no reason to be, as this was a hotel definitely worthy of its 4 stars. Its location was perfect and the hotel was beautiful. The hotel was so clean that you could eat your food off the floor!!! The cleaners are amazing, they work non stop and make lovely patterns on your bed everyday. I am the worlds fussiest eater and was so worried that i would not eat much in Bulgaria however, we were all sooooo impressed with the food that most nights i ate so much, it was like i had never eaten before. There was so much choice every night that we never ate out which is really unusal for us. The entertainment team tried really hard but we were always so busy doing other stuff. Location is perfect, as the hotel is close to the beach, Nessebar, and the main strip. All in all, we would recommend this holiday and defintely this hotel to anyone and everyone. This was a great Hotel. Kids Club very good.Very Clean. Great choice of food.Well situated,not far to walk for resort centre where very busy and lots of choices of places to eat although we ate mostly at the hotel cause food hot, fresh with plenty of choice. The hotel was extremely clean and there were cleaning staff on duty all day and night. We never saw anything that had not been cleaned. The lifts, stairs and hallways were immaculate and the room was always cleaned toan extremely high quality. We are very fussy eaters, but did not find any issues with the food. There was always a variety of different meats and other foods available. The hotel is not right in the middle of the Sunny Beach resort, but everything is within easy walking distance and the hotel is very close to a bus stop, which makes it easy to get to Nessebar too. The hotel staff were polite, courteous and extremely helpful. When there were any issues, they were fixed immediately and the staff would always check back with you afterwards to ensure satisfaction. The entertainment team were fantastic. They speak English and German fluently, so they are capable of communicating with everyone. They were very friendly and made the holiday fun, as there was always something to do, if you wanted to join in. We would definitely recommend this hotel to other people and are already planning our next trip. We stayed in this hotel in May 2007 for 2 weeks on a half-board basis. On arrival the bellboy took our cases to the room. We found the hotel to be spotless everywhere - rooms, dining room, corridor, stairs, lifts, pool side. There are always cleaners busy working away. The hotel is only 2 minutes from the beach and about 10 minutes walk to the resort centre. There is also a mini train that runs to the centre from just outside the front door. The staff are very friendly and great with children. Always making a fuss of our baby and the children at the kids club were always laughing and having a great time. There was daytime entertainment at the pool - aqua-areobics, water polo etc., shooting and more and there was always a show at night and sometimes bingo etc. The food was german orientated for breakfast but there was a cook outside who would make you fried egg, omlette, pancakes etc. The evening meal was always good and there was always pizza, chips, pasta if you didn't like the daily specials. Loads of salad stuff and fruits too. Deserts were out of this world. Prepare for the post holiday diet. I would definately stay here again. 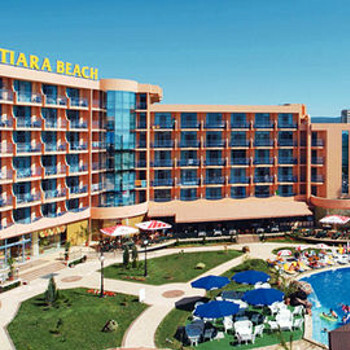 Going back to Sunny Beach in September 2007 but staying in Iberostar Sunny Beach as unfortunately this hotel was full! Myself and my partner stayed at the Iberostar Tiara Beach between the 4th - 18th September 2006. The hotel is a 4-star hotel and with the exception of the hotel food this rating would reflect the standards we experienced. The hotel is situated towards the southern end of the resort and is a 15 minute walk from all the action. If you have mobility difficulties or are just lazy like us then there is a mini train that runs every 15 minutes and you can get it right outside the hotel. We arrived at the hotel mid afternoon and our cases were brought to our room by the hotel bellboy. The double bedroom was extremely large and exceptionally clean. This is a large, comfortable hotel geared to West European tastes and to families. Everything is spotlessly clean and well-maintained. It is close to the beach, shops, and restaurants and although near the resort action, is quiet at night. The buffet restaurant offers a very wide choice of food, and you are bound to find something you like. If possible, go for a table outdoors, where it is quieter, more comfortable, and cooler. The inside restaurant is bustling, over-brightly lit, and seems rushed and crowded. Our bedroom was large, overlooked sand dunes, and had good air conditioning. Hotel staff were all friendly and polite. There is an excellent swimming pool with lots of sunbeds around it. The hotel grounds are small, and there are no garden areas if you do not want to be close to the pool. Great hotel with friendly organised staff. Excellent rooms and pools. Good restaurant and bars. Tiara Beach is a fantastic Hotel, with fantastic staff and in an excellent location. Not too far from the busy nightlife, but not right in the middle of it. But I would not go back there until they change the rules on SMOKING. Our holiday was ruined because of the constant fug of tobacco throughout the hotel. The nicotine smell was ingrained into the bed linen! If you are non smoking I would heartily recommend that you think carefully before staying here. I have written to Iberostar and received a nice reply from the Hotel Management, but basically they say the main restaurant is no smoking, but the rest will stay as smoking areas. The reception, bar and lounge are absolutely lovely places, its just a shame its under a blanket of smoke. The food was varied and plenty of it - but its very much geared towards the German palete, so we found ourselves eating out most evenings. Breakfast was also very continental, but plenty of fresh fruit available. Overall a very lovely hotel. The staff are brilliant and very helpful, especially the reception. The facilities in the hotel are great and the massage man was lovely. If I want to come home smelling like an ashtray I will definately stay there again. We moved to this hotel two weeks before we were due to fly out due to Iberostar Sunny Beach Resort not being ready. What a result ! Friendly staff with excellent porter service bringing our luggage to our room. The hotel was spotless, rooms immaculate with maid service every day. The hotel staff were all very nice and would always greet you with a friendly "hello" and a smile. Entertainment staff organised games during the day which you could join in if you wanted. They also handed out pieces of fruit during the day for guests lying by the large swimming pool. The food in the hotel was average. Breakfast was geared towards the German market. Dinner was alright but the food was much better if you ate out.